This painting was done on Pastelmat, not black this time but a peach color that crept into the shadows. 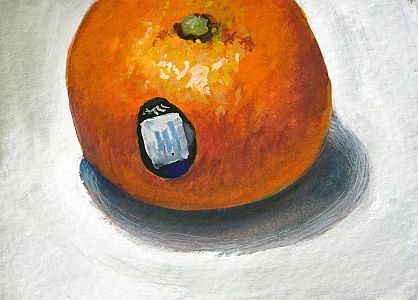 I found that as I painted it the color of the raw paper was so charming that I chose the peach to flavor the 'gray' shadows. (I always see color in gray!) These are not cherries, though they're about that size. This is the fruit that grows on our ornamental plum tree. The birds seem to love them, despite the fact that they remain hard and never sweeten. I enjoy the deep purple and red-violet color of the foliage, which has a green note underneath. I enjoy the symbolism of dissimilar fruits in relation to one another, and the simple color palette pleases me. It's painted on black Pastelmat. Doesn't that lemon look comfy? Back to landscapes! I've always enjoyed the red rock areas of New Mexico, especially up in Abiquiu (say: AB-i-cue) in what has come to be thought of as Georgia O'Keeffe country. The contrast of the sweet blues and greens of the bushes against the dull reds and sandy golds really makes for a nice palette of colors. This was painted on my current favorite, black Pastelmat. It's not a strict rendering of an exact place, more an interpretation of the area. I had one tomato left, bereft of its companion (which was delicious.) Again, this was painted on the wonderful texture of Pastelmat, again using the black, which is really more of a charcoal gray color. I enjoy the juicy look of the white ground color, which is worked around the details. It gives a painterly look. 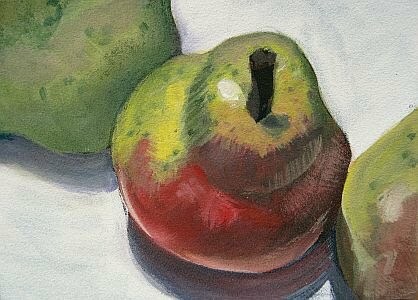 These pears were just delicious, both to paint and to eat! I was intrigued with the blush of red along one side. 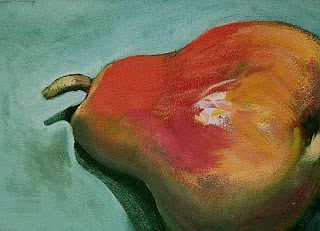 Are pears some kind of rite of passage for every artist? Much the way every pastelist is expected to paint a ballerina! Predictable, I'm sure, but I'm really enjoying my little fruit and vege explorations. I hope you are, too. These three are on black Pastelmat. I painted this one on Bristol vellum, underpainted with a dark blue-violet. I wanted the white ground to have a little more painterly quality to it, and I knew it would make the shadow easier to paint. I just worked around it, as you can see. The label was a necessity, IMHO, to add color, texture and impact! Hope you agree. 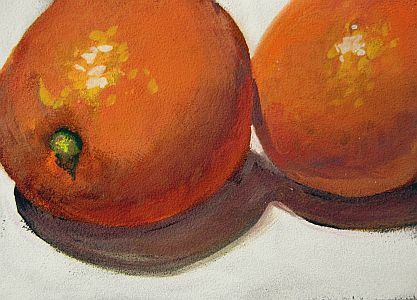 I was given a huge box of navel oranges fresh from the grove in California, so when I began to look for subject matter there they were right in front of me. 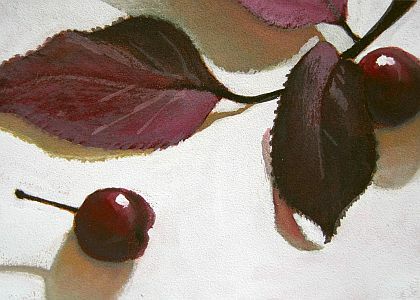 This painting is on black Pastelmat, a current favorite of mine. I really enjoy using this paper. 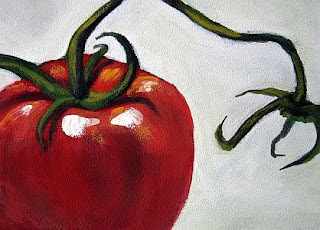 The gouache builds up in slow layers but retains a nice texture throughout. I'm starting to picture a wall full of these little paintings framed in simple moldings, hanging in the kitchen. What do you think? 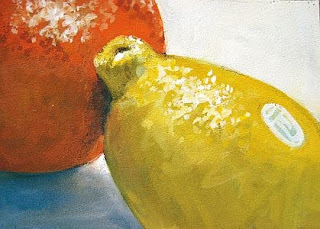 Something new for me, still life paintings! I've also decided to begin to add comments where you can easily see them below the paintings. 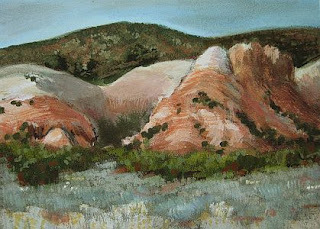 This one is on black Pastelmat, which gives it a look I really like. The texture makes it juicy, I think.